One of the more controversial features of Dublin's skyline is a pair of striped exhaust chimneys out in Ringsend, part of an oil-burning power plant that closed in the '70s, though the building lingers on. In a city where 10 floors makes a "skyscraper" (and there aren't that many of those), anything as tall as these things definitely stands out. 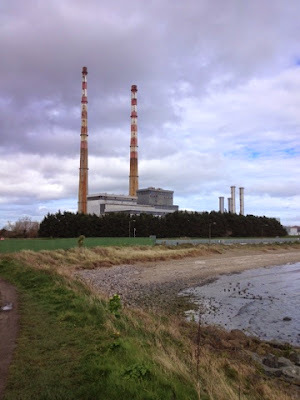 The chimneys are one of those love-it-or-hate-it features of Dublin, with some people decrying them as a hideous eyesore and others defending them as a cherished local landmark. I fall firmly on the "love it" end of the spectrum. Maybe it's a side effect of an upbringing surrounded by chemical refineries (they really are magical all lit up at night y'all) but I have something of a fondness for industrial installations, and I like these a lot. Living on the southeast side I see them every day, unless low clouds block them from view. I look for them when I fly into Dublin, because they say "home" to me.